Inle Lake (Burmese: အင်းလေးကန်, pronounced [ʔɪ́ɴlé kàɴ]), a freshwater lake located in the Nyaungshwe Township of Taunggyi District of Shan State, part of Shan Hills in Myanmar (Burma). It is the second largest lake in Myanmar with an estimated surface area of 44.9 square miles (116 km2), and one of the highest at an elevation of 2,900 feet (880 m). During the dry season, the average water depth is 7 feet (2.1 m), with the deepest point being 12 feet (3.7 m), but during the rainy season this can increase by 5 feet (1.5 m). The watershed area for the lake lies to a large extent to the north and west of the lake. The lake drains through the Nam Pilu or Balu Chaung on its southern end. There is also a hot spring on its northwestern shore. Although the lake is not large, it contains a number of endemic species. Over twenty species of snails and nine species of fish are found nowhere else in the world. Some of these, like the silver-blue scaleless Sawbwa barb, the crossbanded dwarf danio, and the Lake Inle danio, are of minor commercial importance for the aquarium trade. It hosts approximately 20,000 brown and black head migratory seagulls in November, December and January. In June 2015, it became Myanmar's first designated place of World Network of Biosphere Reserves. It was one of 20 places added at the Unesco's 27th Man and the Biosphere (MAB) International Coordinating Council (ICC) meeting. Since 2018 it has been designated as a protected Ramsar site. Inle Lake with its leg-rowing Intha people is a major tourist destination in Burma. Positioning eel traps in Inle Lake. The people of Inle Lake (called Intha), some 70,000 of them, live in four cities bordering the lake, in numerous small villages along the lake's shores, and on the lake itself. The entire lake area is in Nyaung Shwe township. The population consists predominantly of Intha, with a mix of other Shan, Taungyo, Pa-O (Taungthu), Danu, Kayah, Danaw and Bamar ethnicities. Most are devout Buddhists, and live in simple houses of wood and woven bamboo on stilts; they are largely self-sufficient farmers. Lotus thread is used to weave a special robe for the Buddha. 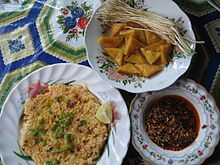 Htamin jin (fermented rice) served with hnapyan jaw (twice-fried Shan tofu) is a popular local dish. Fish caught from the lake - the most abundant kind is called nga hpein locally (Inle carp, Cyprinus intha) - are a staple of the local diet. A popular local dish is htamin gyin - 'fermented' rice kneaded with fish and/or potato - served with hnapyan gyaw (literally twice fried - Shan tofu). In addition to fishing, locals grow vegetables and fruit in large gardens that float on the surface of the lake. The floating garden beds are formed by extensive manual labor. The farmers gather up lake-bottom weeds from the deeper parts of the lake, bring them back in boats and make them into floating beds in their garden areas, anchored by bamboo poles. These gardens rise and fall with changes in the water level, and so are resistant to flooding. The constant availability of nutrient-laden water results in these gardens being incredibly fertile. Rice cultivation and consumption is also significant facet of the local diet and agricultural tradition. Beida (water hyacinth) clogs up the smaller streams. Inle Lake is suffering from the environmental effects of increased population and rapid growth in both agriculture and tourism. During the 65-year period from 1935 to 2000, the net open water area of Inle Lake decreased from 69.10 km² to 46.69 km², a loss of 32.4%, with development of ﬂoating garden agriculture, which occurs largely on the west side of the lake (a practice introduced in the 1960s). Another cause for concern is the planned introduction of non-native fish species, such as the Grass Carp (Ctenopharyngodon idella)] intended to improve fishery. Sanitation in the villages around the lake is an ongoing concern for public health authorities, due to untreated sewage (with 72% of households using open pits, not latrines) and waste water flowing into the lake. To ensure fresh and clean water, some villages now have enclosed wells and public access to the well water. Some studies of the lake's surface water quality indicates that the water is not safe for consumption. Water from Inle Lake has dissolved oxygen ranges lower than those necessary for fisheries and aquatic life, while nitrite, nitrate and phosphate ranges are unusually high. Noise pollution is also a noticeable issue. The noise from the cheaper poorly muffled diesel engines driving the stern drive propellers is significant, and can be a distraction to the otherwise tranquil lake. The summer of 2010 registered very high temperatures causing the water level of the lake to drop so low, the lowest in nearly 50 years, that drinking water had to be fetched from elsewhere and the floating market was in danger of disappearing. One other serious consequence was that the hydroelectric plant at Lawpita, where the former capital Yangon received its power supply from, could not operate at its full capacity. In 2015 the United Nations added Inle lake to its World Network Biosphere Reserves. There are a total of 651 sites in 120 countries in this network, but Inle Lake is the first biosphere reserve to be added for Myanmar. A number of festivals occur from August to October on Inle Lake and in the surrounding areas. The ceremonial Hpaung Daw U Festival, which lasts for a total of 18 days, is closely followed by the Thadingyut festival of lights. Inthas and Shan turn out in their best clothes in great numbers to celebrate the Buddhist Lent. Traditional boat racing, with dozens of leg-rowers in traditional Shan dress compete on teams with a team on each boat. These boat races are locally one of the most anticipated affairs during the Hpaung Daw U Festival. One of the tourist attractions in the village on the lake itself is the traditional silversmithing, which has fed into the local tourist economy. The silver is brought in from the mines that line the hills surrounding the lake and is boated into the village. Almost all the houses in the village on the lake itself sit on stilts and are made of woven bamboo. Tourists can satisfy their need for trinkets and memorable tokens by observing the silver being smithed and purchase items on-site. If silversmithing doesn't interest a visitor there are also local silk workshops that operate on the lake in a very similar manner as the silversmiths. Hand-made goods for local use and trading are another source of commerce. Typical products include tools, carvings and other ornamental objects, textiles, and cheroots. A local market serves most common shopping needs and is held daily but the location of the event rotates through five different sites around the lake area, thus each of them hosting an itinerant market every fifth day. When held on the lake itself, trading is conducted from small boats. This 'floating-market' event tends to emphasize tourist trade much more than the other four. While hot air balloon flights are more popular in Bagan, they are also provided over Inle Lake with Balloons Over Bagan. There is also a winery near the lake, called Red Mountain Estate. Inle cuisine is different from Shan cuisine, as it incorporates local natural produce. The most well-known Inle dish would be the Htamin jin - a rice, tomato and potato or fish salad kneaded into round balls dressed and garnished with crisp fried onion in oil, tamarind sauce, coriander and spring onions often with garlic, Chinese chives roots (ju myit), fried whole dried chili, grilled dried fermented bean cakes (pè bouk) and fried dried tofu (topu jauk kyaw) on the side. ^ a b "Inlay Lake Ramsar Site". Ramsar Sites Information Service. Retrieved 10 September 2018. ^ Aye Sapay Phyu. "Inle Lake joins UN list of biosphere sites". mmtimes.com/. Retrieved 19 June 2015. ^ "Inle Lake designated biosphere reserve". nationmultimedia.com/. Retrieved 19 June 2015. ^ a b Roy C. Sidle, Alan D. Ziegler and John B. Vogler (April 2007). "Contemporary changes in open water surface area of Lake Inle, Myanmar". Sustainability Science. 2 (1): 55–65. doi:10.1007/s11625-006-0020-7. ISSN 1862-4065. Retrieved 22 June 2010. ^ a b c Fumiko, Akaishi; Motoyoshi Satake; Masahiro Otaki; Noriko Tominaga (13 April 2006). "Surface water quality and information about the environment surrounding Inle Lake in Myanmar" (PDF). Limnology. Japanese Society of Limnology: 57–61. ^ Ko Htwe. "Electricity for Businesses Cut Off in Rangoon". The Irrawaddy, May 17, 2010. Archived from the original on May 19, 2010. Retrieved 2010-05-17. ^ Ba Kaung. "Businesses May Close Because of Power Cuts". The Irrawaddy, May 21, 2010. Archived from the original on May 28, 2010. Retrieved 2010-05-29. ^ Sapay Phyu, Aye (June 11, 2015). "Inle Lake Joins UN List of Biosphere Sites". Myanmar Times. Retrieved March 23, 2017. ^ "Inle Lake Myanmar". Archived from the original on 2004-11-02. ^ "Myanmar's Traditional Silversmiths Shine On". MyanmarBurma.com. September 13, 2013. Archived from the original on 2013-11-07. Retrieved March 23, 2017. ^ "Fifth day markets". JourneysMyanmar. Retrieved 2007-02-19. ^ "The Elegant and Sacred Lotus Robe". Myanmar Travel Information. 2006. Archived from the original on 2006-12-18. Retrieved 2007-02-18. ^ Once in a Lifetime Journey. "The Ultimate Guide to Inle Lake". Wikimedia Commons has media related to Inle Lake. Wikivoyage has a travel guide for Inle Lake.